Diamond Lake is one of the cleanest and most beautiful lakes in the state of Washington.We think that everybody who lives or visits here realizes what a treasure this lake is. We love it here. The fact that you can stand chest deep in the water and see your toes with complete clarity is amazing, and we are proud of it! Our lake is large enough to support all sorts of water sports,fishing, and wildlife, but small enough to create a great sense of community. 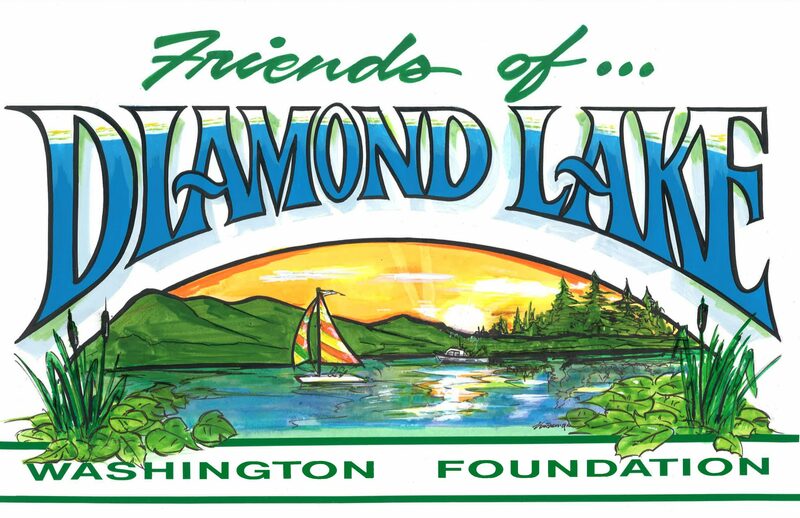 Our mission for this Foundation is to strive to protect and preserve the water and enhance the quality of life on Diamond Lake. We hope to engage the lake community in this mission with us! lake life better by supporting the Boy Scouts and our Diamond Lake Fire Department, presenting the Fourth of July firework display, and paying for the streetlights around the lake. Please remember that all of these programs are supported by YOU! Thank you to all of you who have invested in the lake in the past – we are asking for new and continued support for protecting our lake. We have created a new website, accessed at friendsofdiamondlake.net. Please visit and enjoy browsing newsletters, project updates, photos, etc. You can also make your tax deductible donation online either to a specific project of your choice, or to the general fund. We love volunteers! The board members of the Foundation are truly dedicated to preserving and protecting our lake. Share your fun with others!